Indian Navy Recruitment 2018 for Apprentices posts, Apply Online. Indian Navy Recruitment 2018: Application process for 275 Apprentices posts @ apprenticeship.gov.in. 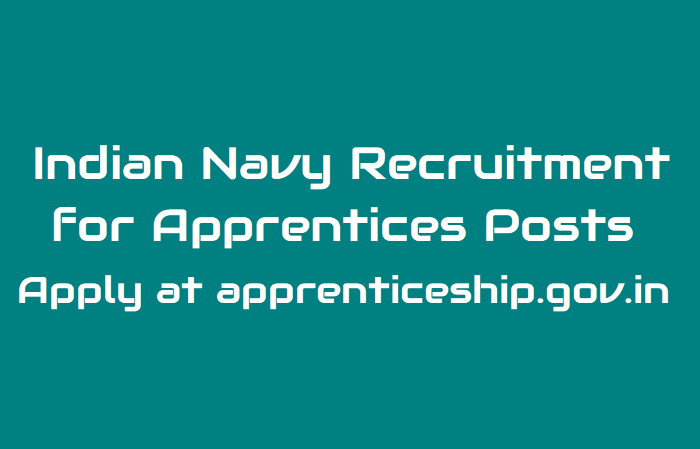 The Indian Navy has released advertisement for online application for the Apprenticeship Training programme at the Naval Dockyard Apprentices School, Visakhapatnam. Indian Navy has invited candidates to apply for Apprenticeship Training programme at the Naval Dockyard Apprentices School, Visakhapatnam. The training will be for one year duration and two years duration. Candidates who want to apply for the post can visit the site at apprenticeship.gov.in and apply for the post on or before December 05, 2018. The training will commence from April 1, 2019. Hostel will not be provided and so candidates will have to make their own arrangements. The filled up application form should reach The Officer-in-Charge (for Apprenticeship), Naval Dockyard Apprentices School, VM Naval Base S.O., P.O., Visakhapatnam - 530 014, Andhra Pradesh before December 12, 2018.